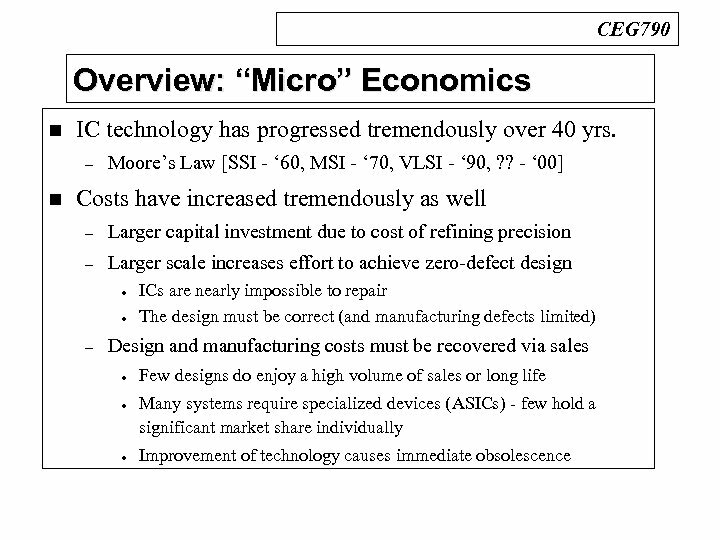 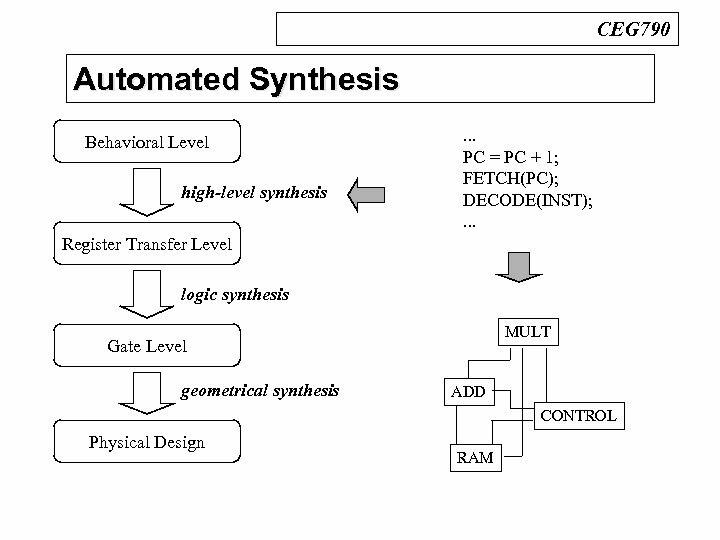 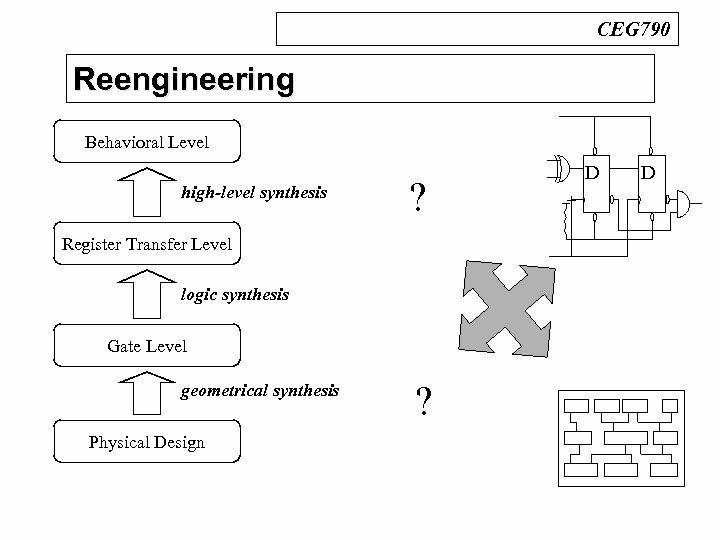 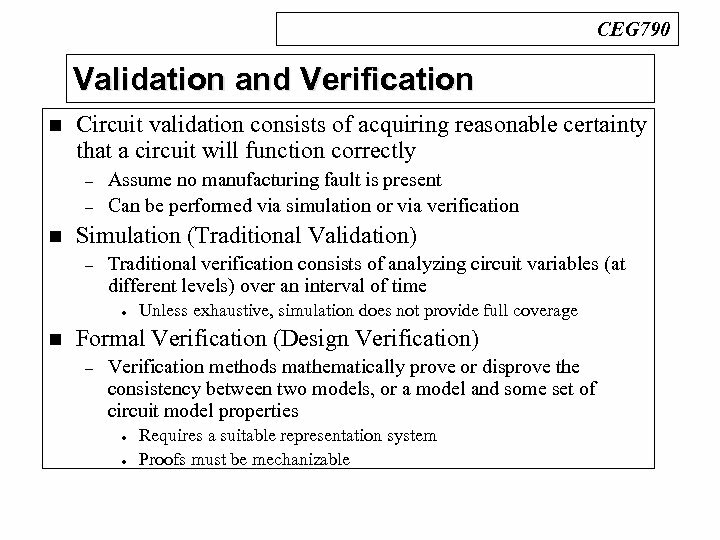 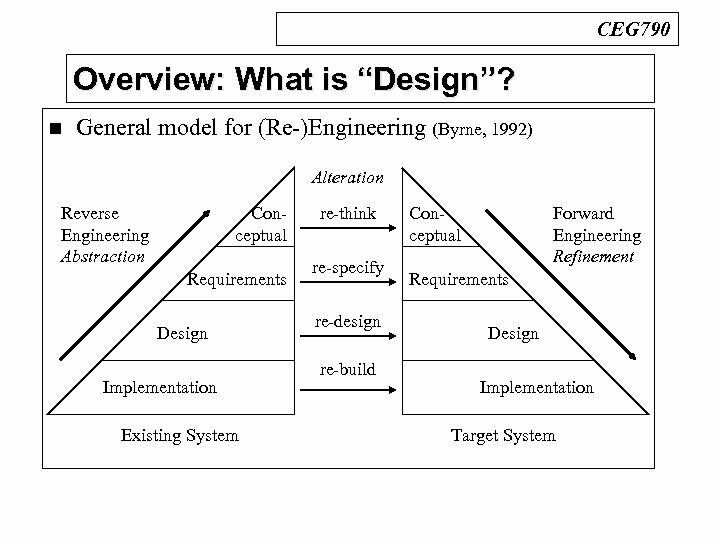 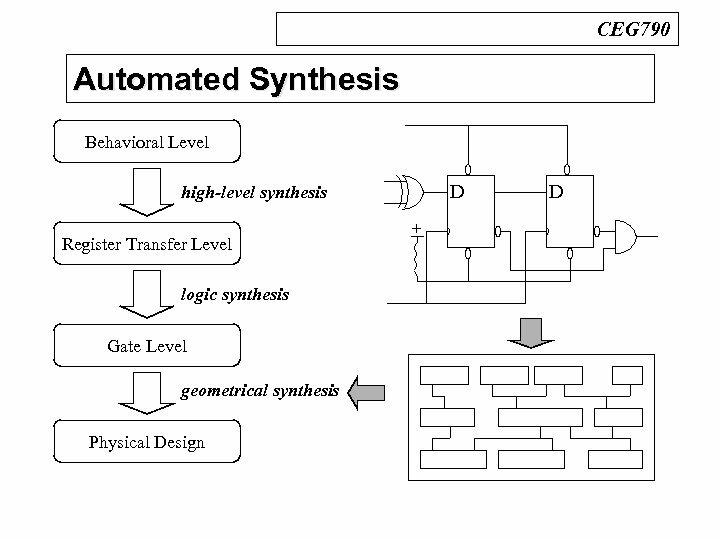 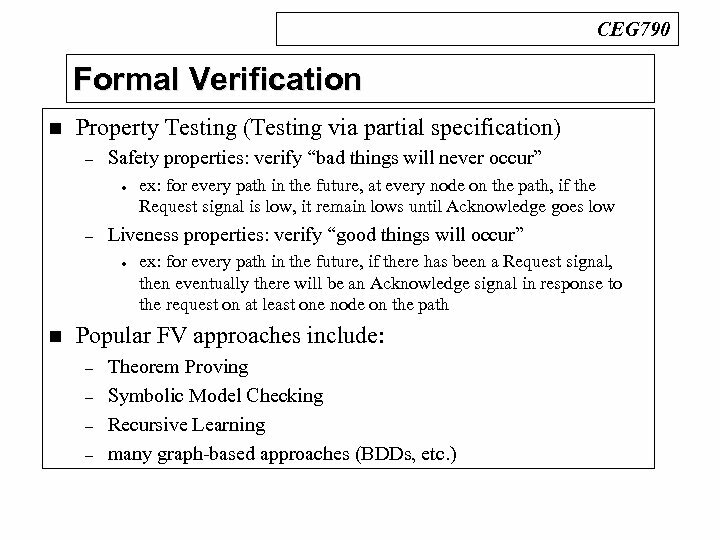 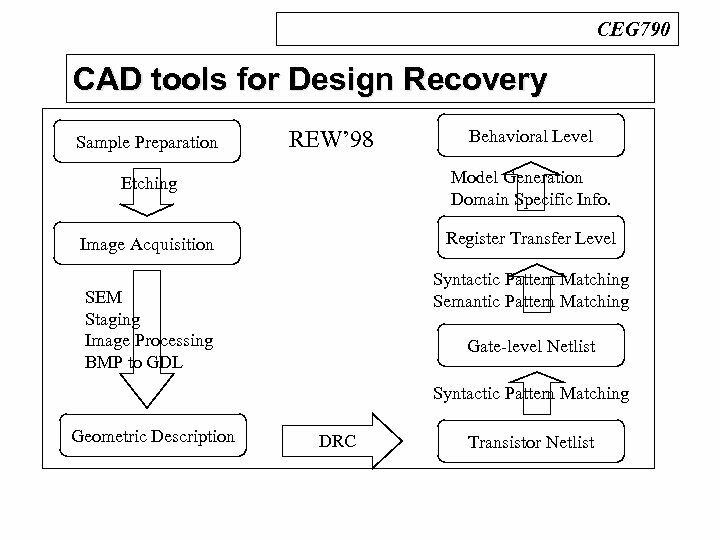 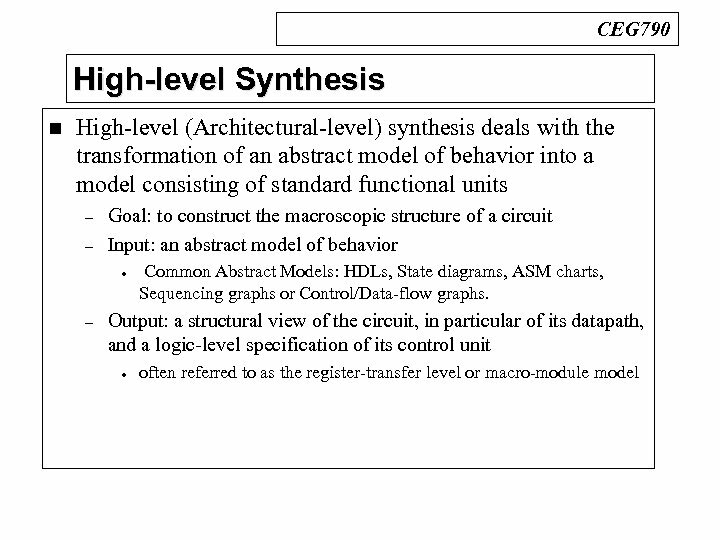 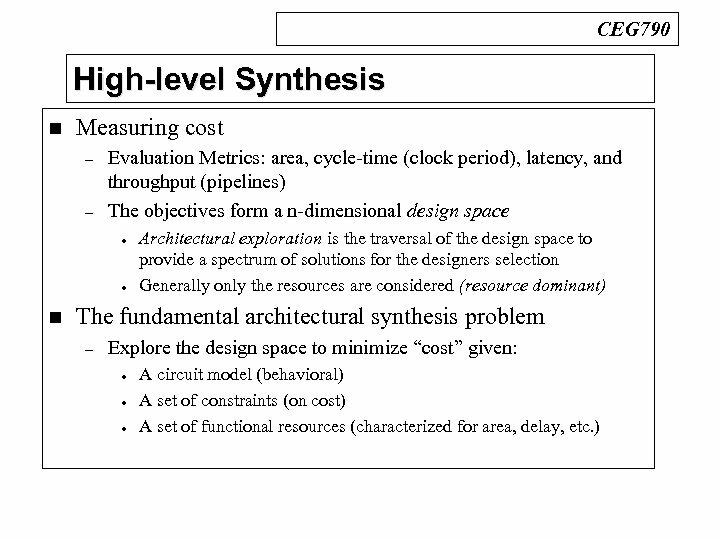 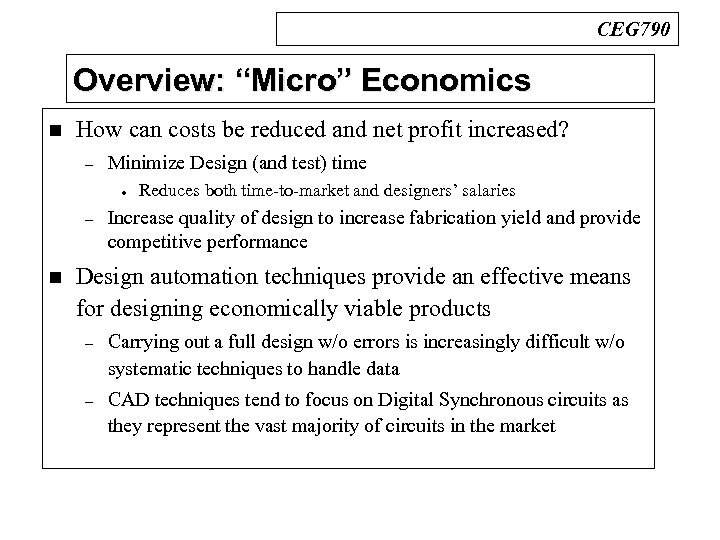 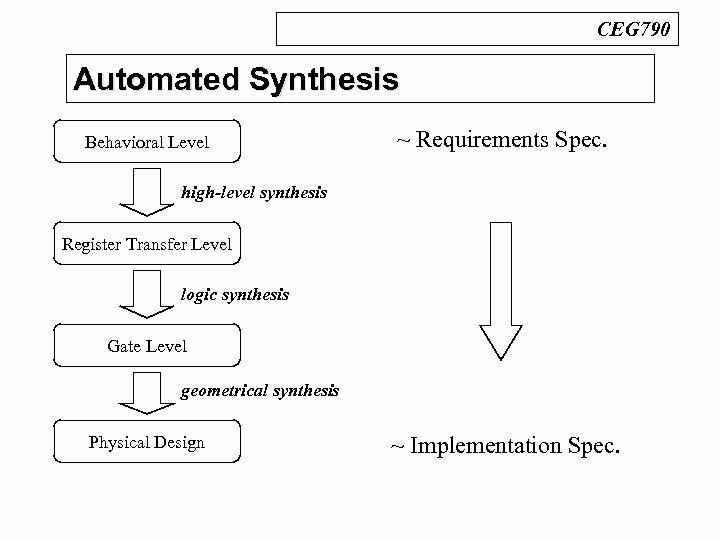 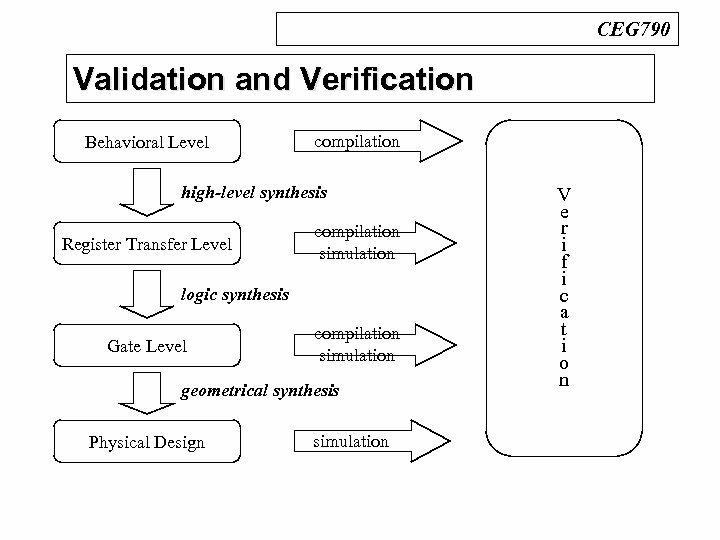 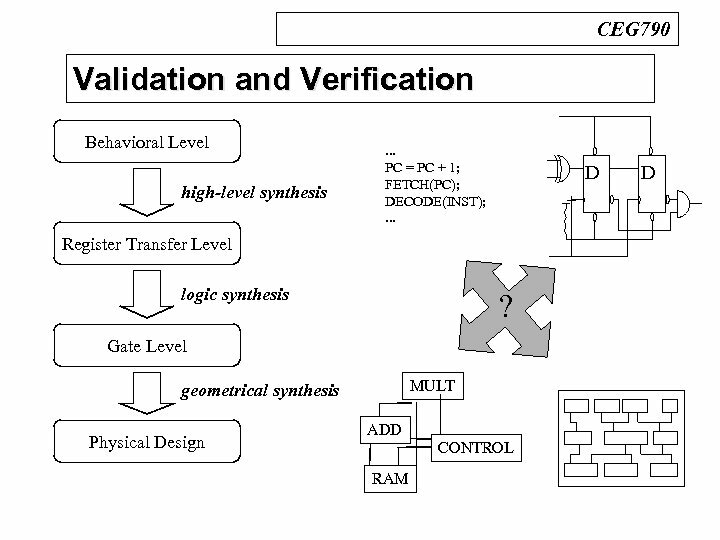 CEG 790 Automated Synthesis n Design Process Behavioral Level ~ Requirements Spec. 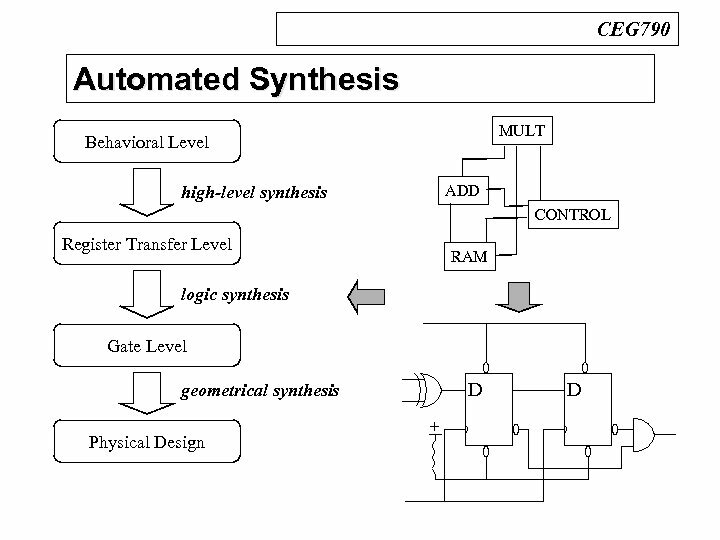 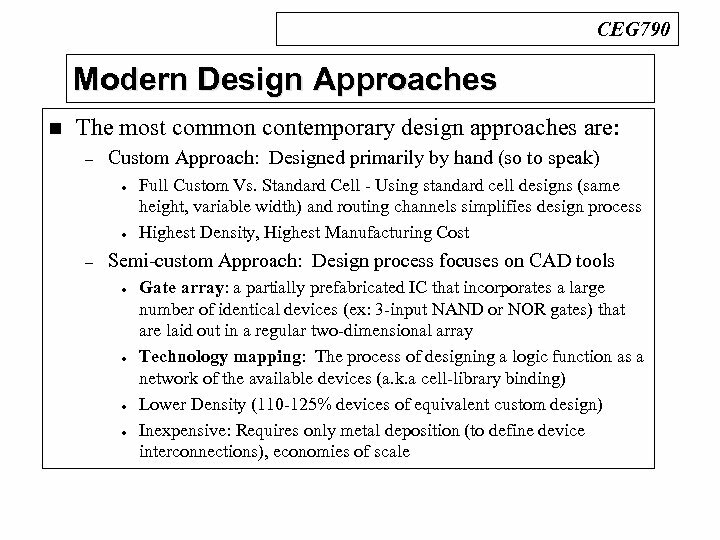 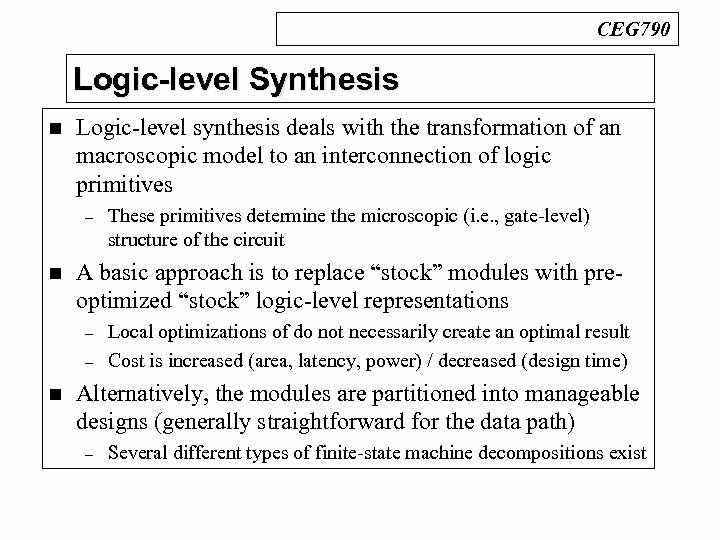 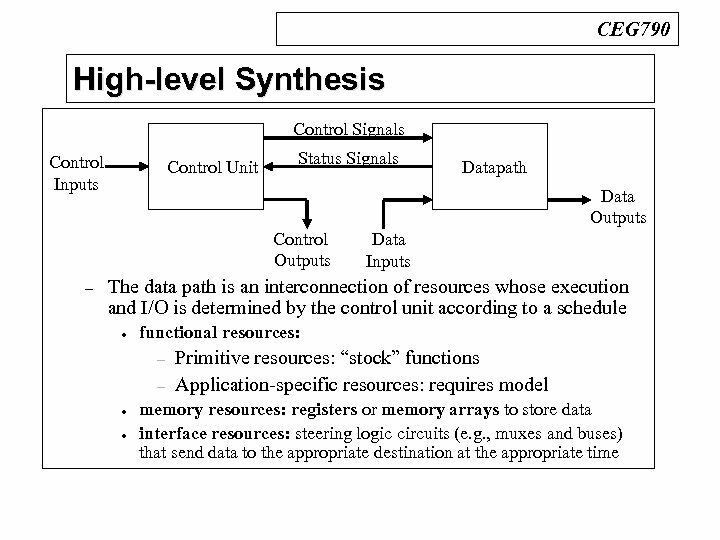 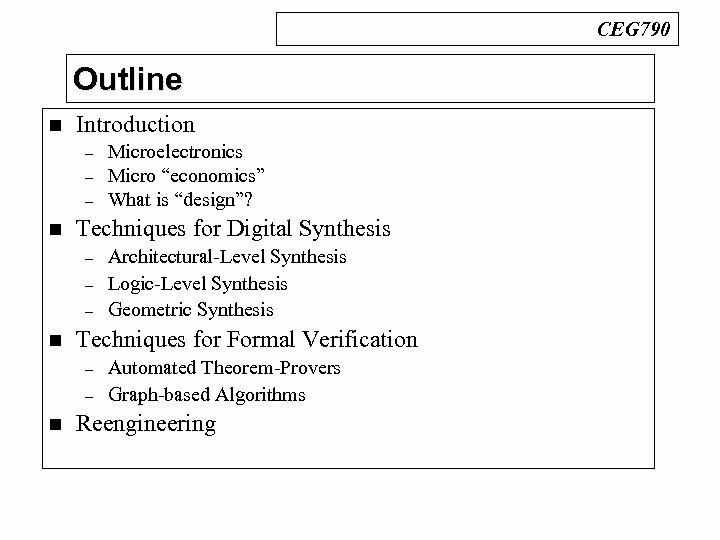 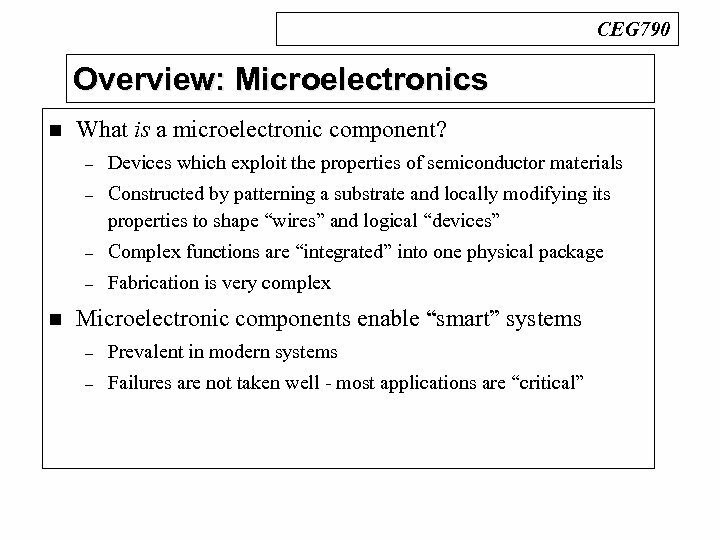 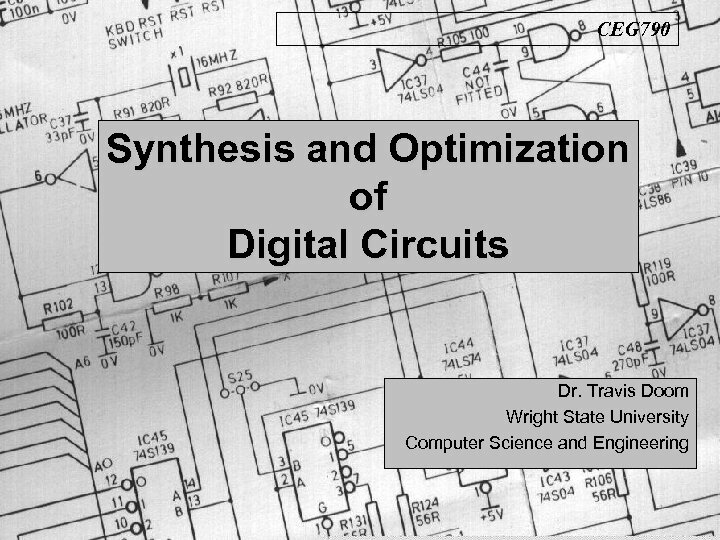 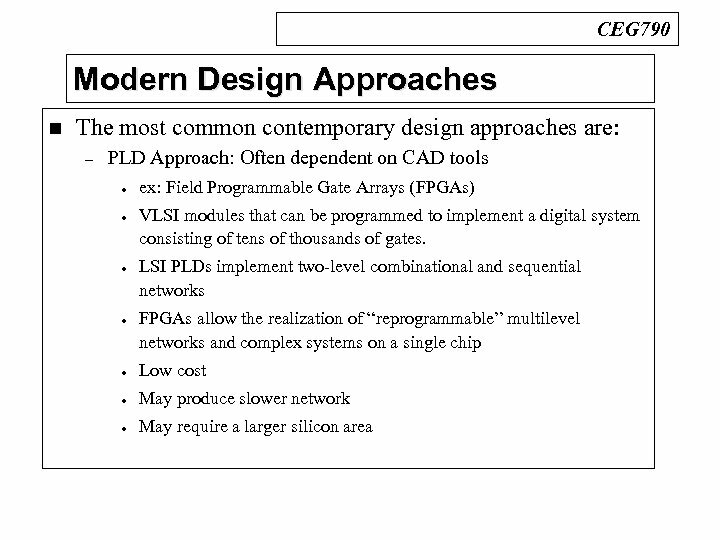 high-level synthesis Register Transfer Level logic synthesis Gate Level geometrical synthesis Physical Design ~ Implementation Spec. 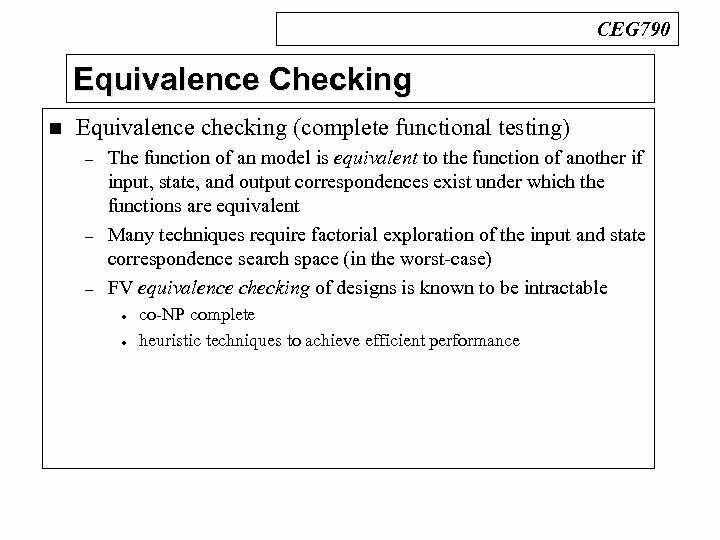 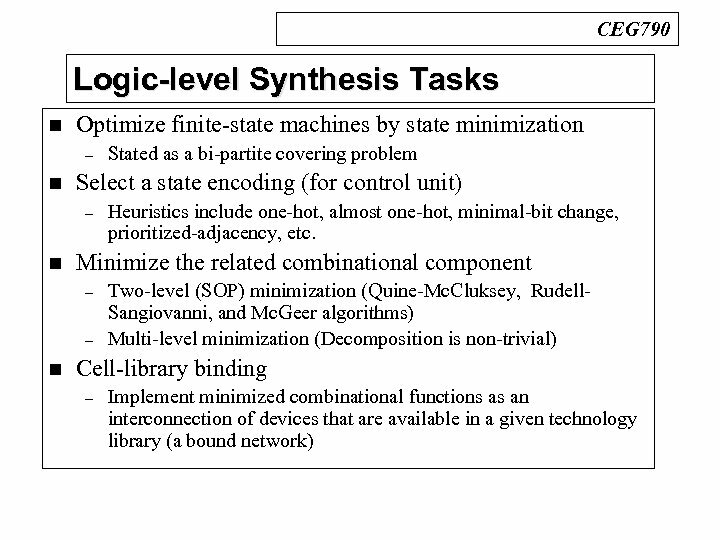 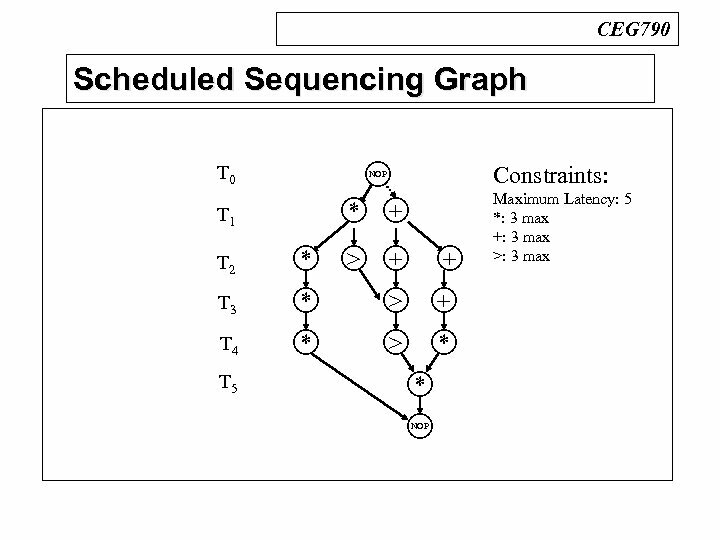 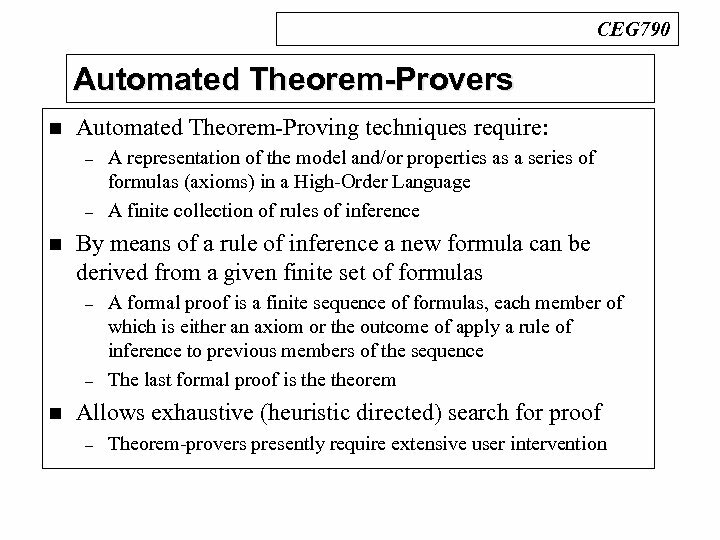 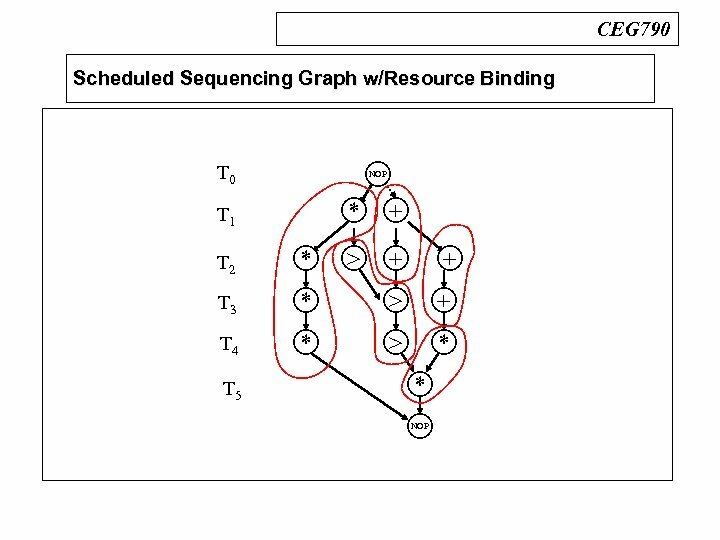 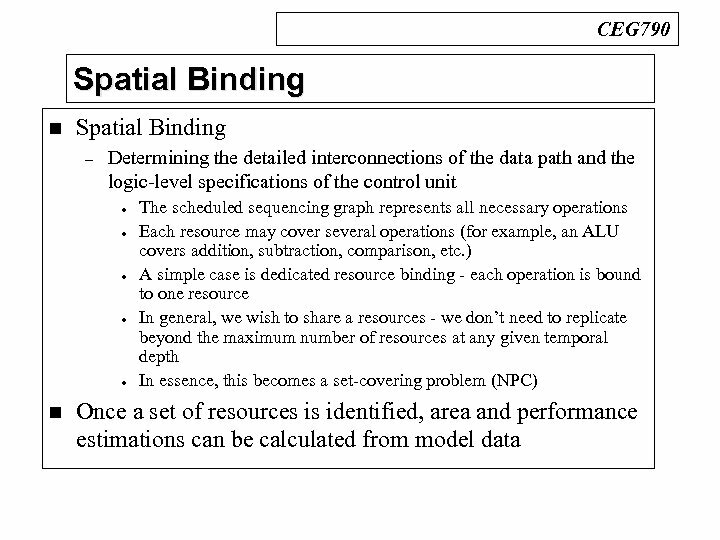 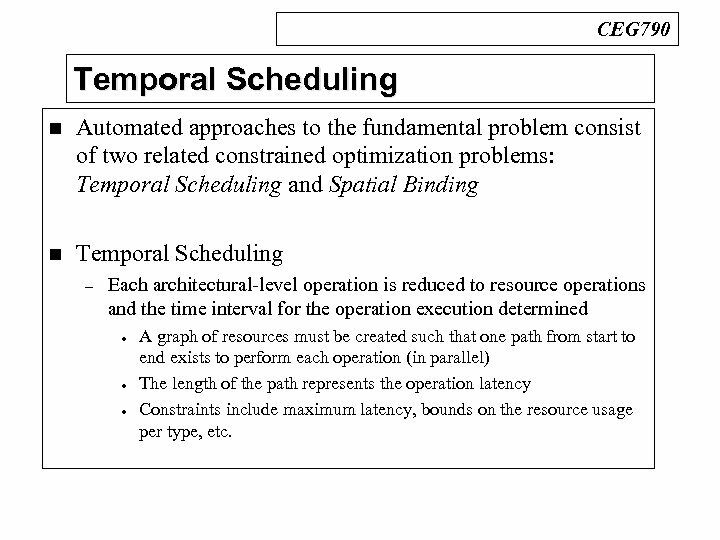 CEG 790 Temporal Scheduling n Automated approaches to the fundamental problem consist of two related constrained optimization problems: Temporal Scheduling and Spatial Binding n Temporal Scheduling – Each architectural-level operation is reduced to resource operations and the time interval for the operation execution determined l l l A graph of resources must be created such that one path from start to end exists to perform each operation (in parallel) The length of the path represents the operation latency Constraints include maximum latency, bounds on the resource usage per type, etc. 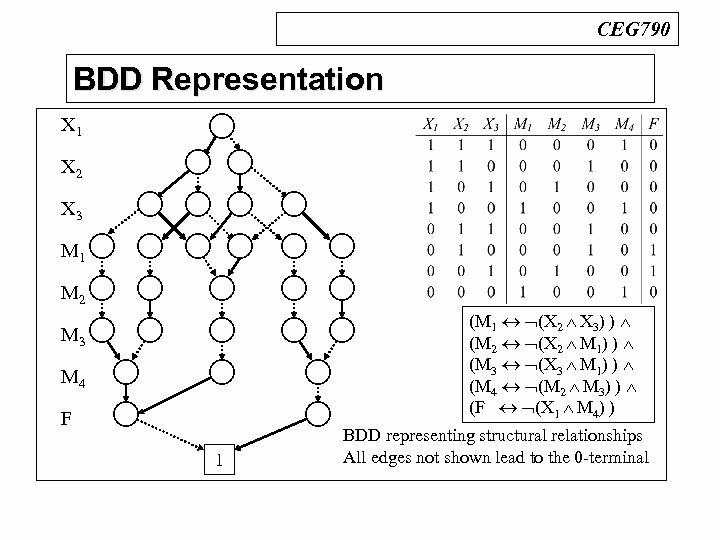 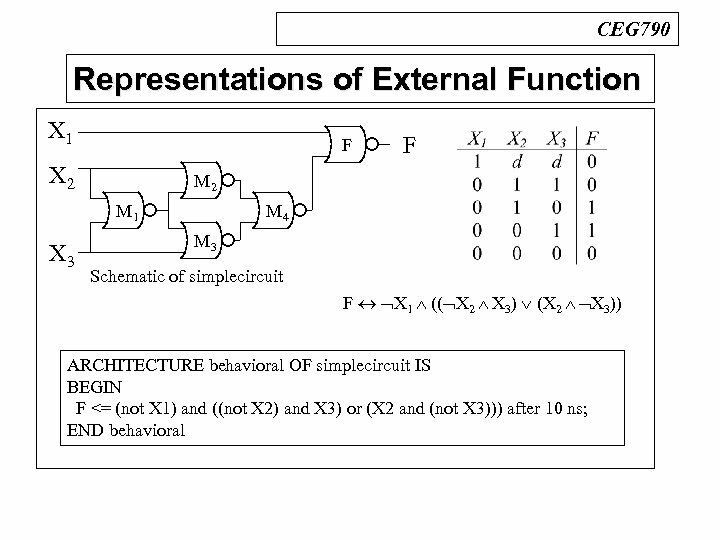 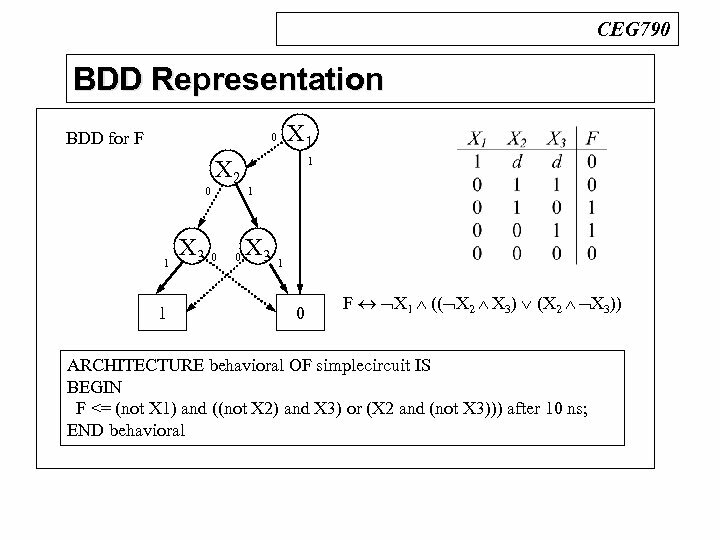 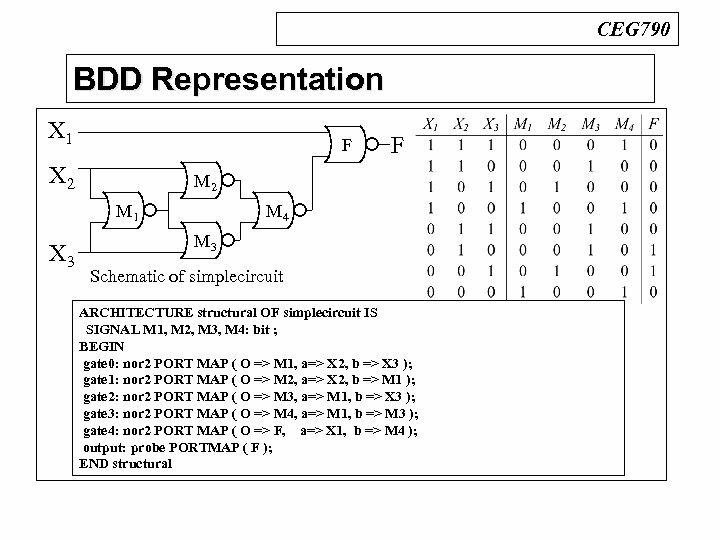 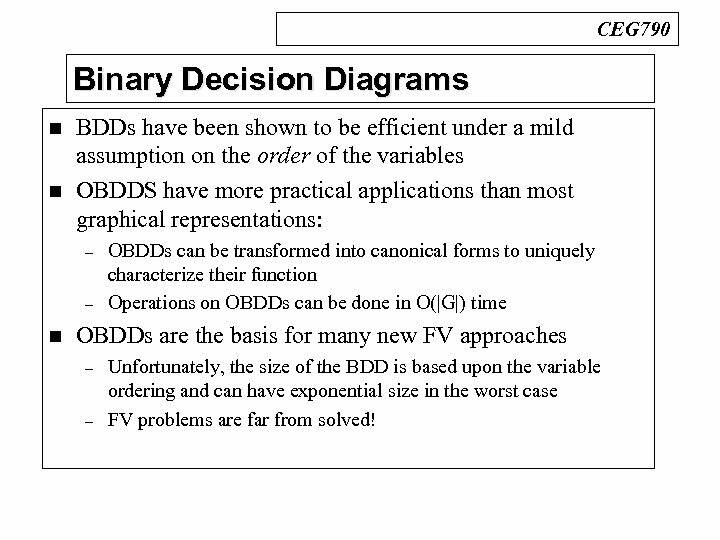 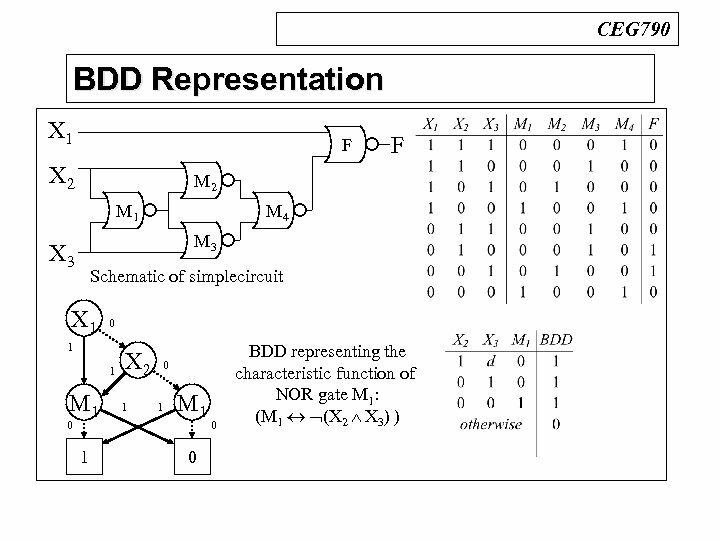 CEG 790 Binary Decision Diagrams n n BDDs have been shown to be efficient under a mild assumption on the order of the variables OBDDS have more practical applications than most graphical representations: – – n OBDDs can be transformed into canonical forms to uniquely characterize their function Operations on OBDDs can be done in O(|G|) time OBDDs are the basis for many new FV approaches – – Unfortunately, the size of the BDD is based upon the variable ordering and can have exponential size in the worst case FV problems are far from solved! 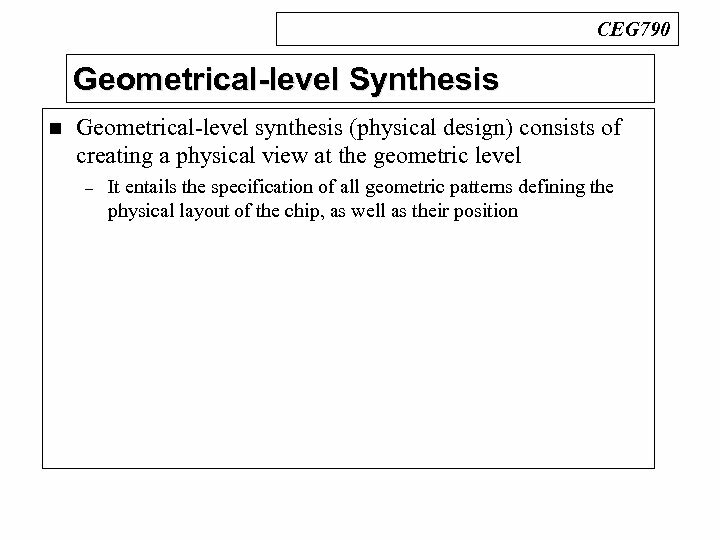 1 Polymers in functionalization of nanoparticles and nanocomposites.